The article shows the FDA to be complicit in licensing the drug at dangerously high doses. The government’s statistics show that OxyContin has led millions of Americans to become addicted, and many thousands to overdose and die. Chemically, OxyContin acts like heroin: when its effect wears off, patients experience excruciating withdrawal symptoms, including intense cravings for the drug. According to the federal government’s National Survey on Drug Use and Health, more than 7 million Americans have abused OxyContin – many of who followed their doctor’s prescription instructions. Their doses were increased to dangerously high levels that increased the likelihood of addiction as well as fatal overdose. The LA Times examined thousands of confidential Purdue documents and records that span three decades, from the mid-1980s when OxyContin was conceived, to 2011. The documents were uncovered in the course of lawsuits and government investigations. The following findings laid out by the LAT, show that Purdue executives acted in bad faith; they precipitated an unconscionable epidemic and preventable deaths in order to maintain high profits. The drug is widely blamed for setting off the nation’s prescription opioid epidemic, which has claimed more than 190,000 lives from overdoses involving OxyContin and other painkillers since 1999. The documents provide a detailed picture of the development and marketing of OxyContin, how Purdue executives responded to complaints that its effects wear off early, and their fears about the financial impact of any departure from 12-hour dosing. The LA Times reports that the first clinical trial was conducted in Puerto Rico on women recuperating from abdominal and gynecological surgery. More than a third of the women given OxyContin started complaining about pain in the first eight hours and about half required more medication before the 12-hour mark, according to an FDA analysis of the study. In study after study, many patients given OxyContin every 12 hours would ask for more medication before their next scheduled dose. For example, in one study of 164 cancer patients, one third of those given OxyContin dropped out because they found the treatment “ineffective,” according to an FDA analysis of the study. Researchers then changed the rules of the study to allow patients to take supplemental painkillers, known as “rescue medication,” in between 12-hour doses of OxyContin. In another study of 87 cancer patients, “rescue was used frequently in most of the patients,” and 95% resorted to it at some point in the study, according to a journal article detailing the clinical trial. Question: did the FDA approve 12-hr OxyContin to accommodate Purdue’s profit margin? FDA officials declined to comment when asked by LAT reporters. And Dr. Curtis Wright, who headed FDA’s medical review of the drug in 1996, left the FDA shortly thereafter. He joined Purdue in new product development. Before OxyContin, doctors had viewed narcotic painkillers as dangerously addictive and primarily reserved their long-term use for cancer patients and the terminally ill. The LA Times notes that Purdue envisioned a bigger market. Purdue’s owners, the Sacklers, were a New York family of physicians and philanthropists whose main source of revenues was MS Contin, an extended release morphine medication for cancer patients, whose patent was running out. “We do not want to niche OxyContin just for cancer pain,” a marketing executive explained to employees planning the drug’s debut, according to minutes of the 1995 meeting. The company spent $207 million on the launch, doubling its sales force to 600. Sales reps showered prescribers with clocks and fishing hats embossed with “Q12h.” Doctors were invited to dinner seminars and flown to weekend junkets at resort hotels, where they were encouraged to prescribe OxyContin and promote it to colleagues back home. After OxyContin hit the market in 1996, ads in medical journals left no ambiguity about how long it lasted. A spotlight illuminated two dosage cups, one marked 8 AM and the other 8 PM. “REMEMBER, EFFECTIVE RELIEF JUST TAKES TWO.” The marketing succeeded in ways that astonished even Purdue executives. OxyContin didn’t just replace MS Contin revenues. It dwarfed them. By the third year, sales were more than double MS Contin’s peak, according to sworn testimony by a Purdue executive. By the fifth, OxyContin was generating annual revenue of more than $1 billion. 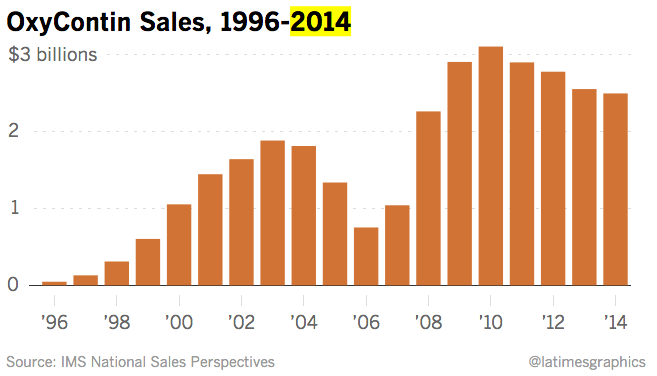 Sales would continue to climb until 2010, when they leveled off at $3 billion. Purdue’s owners, the Sackler family, were already rich — the family name adorns a wing of the Metropolitan Museum of Art and several galleries in the British Museum. The success of OxyContin brought a whole new level of wealth. Forbes magazine last year estimated the Sacklers’ worth at $14 billion, which, the magazine noted, put the family ahead of American dynasties such as the Mellons and Rockefellers. OxyContin’s impact on the practice of medicine was similarly transformative. Other drug companies began marketing their own narcotic painkillers for routine injuries. By 2010, one out of every five doctor’s visits in the U.S. for pain resulted in a prescription for narcotic painkillers, according to a Johns Hopkins University study. OxyContin accounted for a third of all sales revenue from painkillers that year, according to industry data. According to 2001 sales data, the company charged wholesalers on average about $97 for a bottle of the 10-milligram pills, the smallest dosage, while the maximum strength, 80 milligrams, ran more than $630. So its sales reps recommendation to physicians to increase dose rather than reduce the time frame had a very concrete financial incentive. 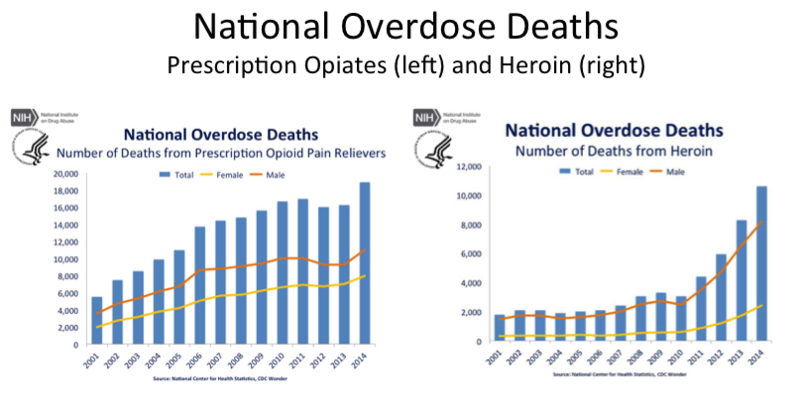 In fact, rates of addiction and overdose have soared alongside the rise in prescriptions. News coverage of these problems in Appalachia and New England in the late 1990s made OxyContin notorious. The U.S. Justice Dept. launched a criminal investigation, and in 2007 the company and three top executives pleaded guilty to fraud for downplaying OxyContin’s risk of addiction. Purdue and the executives were ordered to pay $635 million. The case centered on elements of Purdue’s marketing campaign that suggested to doctors that OxyContin was less addictive than other painkillers. Hundreds of suits were filed accusing Purdue of overstating OxyContin’s duration, among other complaints. Purdue succeeded in having most suits dismissed by asserting a legal doctrine which shields drug companies from liability when their products are prescribed by trained physicians. Purdue settled other lawsuits on confidential terms by succeeding to have the evidence sealed, citing the need to protect trade secrets. The sealed materials included internal memos to members of the Sackler family and others, FDA correspondence, testimony from executives and sales reps’ reports. They remain sealed to this day. The Times reviewed thousands of pages of them. In the fall of 2004, the 12-hour dosing issue came close to a public airing. The West Virginia attorney general was pressing a lawsuit against Purdue demanding reimbursement of “excessive prescription costs” paid by the state through programs for the poor and elderly. The state accused the company of deceptive marketing, including the 12­-hour claim. The decision meant an open trial. Purdue settled for $10 million on the eve before trial so long as all documents presented as evidence remained sealed. The settlement did not require Purdue to admit any wrongdoing or change the way it told doctors to prescribe the drug. A week later, the judge sealed his own decision. Independent doctors and scientists raised questions about the evidence for 12-hr dosing. 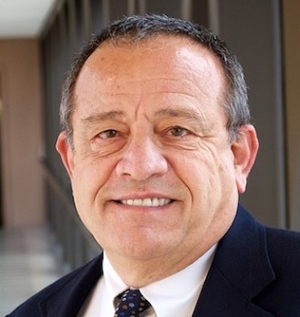 Peter Przekop, a neuroscientist and physician who oversees the treatment of painkiller addicts at the Betty Ford Center in Rancho Mirage, said that repeated episodes of withdrawal from OxyContin “absolutely” raise the risk that patients will abuse the medication. “You are messing with those areas of the brain that are involved in addiction, and you are going to get the person dependent on it,” he said. A separate study underwritten by a Purdue competitor, Janssen Pharmaceutica, reached a similar conclusion. Researchers surveyed chronic pain patients treated with OxyContin and reported that less than 2% said the drug lasted 12 hours and nearly 85% said it wore off before eight, according to a 2003 journal article detailing the research. In the real world practice of medicine, some doctors turned away from OxyContin entirely. San Francisco public health clinics stopped dispensing the painkiller in 2005, based in part on feedback from patients who said it wore off after eight hours. The clinics switched to generic morphine, which has a similar duration and costs a lot less. “What I had come to see was the lack of evidence that it was any better than morphine,” Dr. Mitchell Katz, then head of the San Francisco public health department, said in an interview. For a brief moment three years ago, it seemed the problems with 12-hour dosing might get wider attention. The FDA had called for public input on how to make painkiller labels safer. 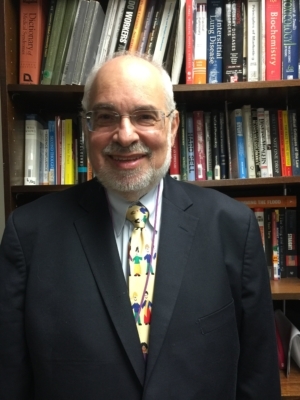 Dr. David Egilman, a Brown University professor of family medicine who had served as a plaintiff’s expert in unsuccessful suits against Purdue, saw it as an opportunity to alert agency officials to problems with OxyContin’s 12-hour claim. Egilman, an expert in warning labels, had worked on hundreds of product liability cases ranging from asbestos to microwave popcorn. He had developed a reputation as a plaintiff’s advocate driven to expose corporate wrongdoing. Some judges said he went too far. In a 2007 case against the drugmaker Eli Lilly, for example, a judge found that Egilman leaked confidential documents about the controversial antipsychotic medication Zyprexa to a New York Times reporter. He agreed to pay the company $100,000. In the OxyContin cases, Purdue had attacked his ethics and qualifications. When FDA officials convened the hearing in a suburban Maryland hotel ballroom Feb. 8, 2013, Egilman was out of the country. He submitted a PowerPoint presentation to be played in his absence. In the five­-minute presentation, Egilman accused Purdue of ignoring its own science for financial reasons and sending patients on a dangerous roller coaster of withdrawal and relief. A snowstorm was bearing down on the East Coast that day, and the hearing room was nearly deserted. When the presentation concluded, there was a brief pause, and then the FDA moderator moved on to the next speaker. Neither Purdue nor the agency ever responded to Egilman’s presentation. OxyContin is still hugely popular. Doctors wrote 5.4 million prescriptions for the painkiller in 2014, and according to a Purdue spokesman, 80% were for 12-hour dosing. After years of the company telling doctors to answer complaints about duration with greater strengths of OxyContin, many patients are taking the drug at doses that public health officials now consider dangerously high. At The Times’ request, scientists at the University of Arkansas for Medical Sciences analyzed OxyContin prescriptions in a database of insurance claims covering about 7 million patients across the country. In 2014, the analysis found, more than 52% of patients taking OxyContin longer than three months were prescribed doses greater than 60 milligrams a day. Guidelines issued this year by the Centers for Disease Control and Prevention urged physicians to “avoid” or “carefully justify” prescriptions of that strength. Dr. Debra Houry, director of the CDC’s National Center for Injury Prevention and Control and a leader of the agency’s response to the opioid epidemic, called it “really concerning.” “The higher you go, the more likely you are to die,” she said. Physicians who frequently contact Purdue with questions about dosing are told that 12-hour dosing has been proved safe. Purdue is a privately held company owned by the Sackler family. The family actively supports many philanthropic organizations. The Sackler wing of the Metropolitan Museum of Art, The Sackler Medical School in Tel Aviv, The Sackler Wing at the Louvre, The Sackler Institutes for Developmental Psychobiology at Columbia, Cornell, Glasgow and Edinburgh Universities, The Sackler Institute for Comparative Genomics at the American Museum of Natural History, The Sackler Center for Arts Education at the Guggenheim Museum, The Serpentine Sackler Gallery in London and The Sackler Institute for Nutrition Science at the New York Academy of Sciences, several galleries in the British Museum and the Arthur Sackler Gallery at the Smithsonian Institution. Posted by Vera Sharav | Tuesday, May 10, 2016 |	Categorized Rx. Drugs, Current Controversies | Tagged David Egilman, OxyContin, Purdue, Sackler, Description of Hell, 12-hour dosing, Eric Holder Purdue, Addiction, Withdrawal, Overdose, corrupt marketing, FDA disregards hazards Bookmark the permalink.